Home » » Spanish start is finally an Arsenal player as BARCELONA confirms deal. Spanish start is finally an Arsenal player as BARCELONA confirms deal. According to the Daily Mail, Denis Suarez has sealed his move to Arsenal today with Barcelona confirming he has signed a contract extension but will spend the next six months on loan at the London based club. Suarez – who reportedly missed Barcelona’s training on Tuesday – previously played under Emery at Sevilla and the Arsenal manager has spoken to the player this month in order to detail his plans and ambitions for his Arsenal team. Barcelona had wanted to cash in on Suarez this month in a £17m deal to Sevilla or Real Betis as his contract expires in 18 months time but Suarez refused to join those clubs due to his desire to return to English football. ‘FC Barcelona and Denis Suárez have reached an agreement for the extension of the player’s contract with the club, which ended on 30 June 2020, until 30 June 2021,’ the Spanish club said in a short statement on Wednesday afternoon. The 25-year-old previously played in the Manchester City youth teams as a teenager before returning to Spain. Arsenal’s hopes of signing Suarez this month appeared to be dwindling as the club do not have the financial means to commit to signing Suarez in January but the move was revived when the midfielder’s agent suggested a £1.8m loan fee and then a summer option in excess of £20m to make the move permanent. In the event Arsenal do complete the £20m plus signing of Suarez in the summer, Manchester City stand to claim over £4m from the deal. The Manchester club inserted a 20 per cent sell-on clause on future international transfers when they agreed to sell the Spaniard, then 19, for £1m to Barcelona in 2013. 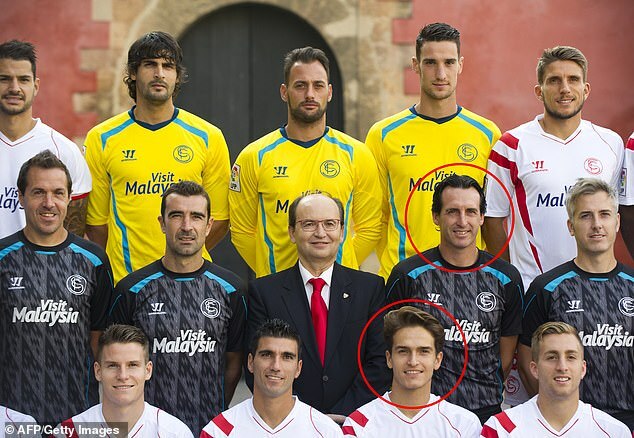 The move will see Suarez (circled) reunite with his former boss at Sevilla Unai Emery (circled) The clause is not obligatory for Arsenal but as part of the agreement, Barcelona have forced Suarez to sign a contract extension until 2021 to protect his market value. Manager Unai Emery welcomed the signing after the Gunners’ win over Cardiff on Tuesday. He said after the game: ‘If a player can come here to help us, he will come. My focus has been on the match and I haven’t spoken to anyone. ‘We need wingers. Suarez, who I know, he has these qualities.’ Asked if Suarez could cope with the physicality of the Premier League, Emery added: ‘I don’t know now. It’s a challenge for him and also to help us.’ Arsenal are still keen to shift Mesut Ozil and his £350,000-a-week wages before the end of the transfer window.